In light of the brutal death and destruction wrought on Libya by the relentless US/NATO bombardment, the professed claims of “humanitarian concerns” as grounds for intervention can readily be dismissed as a blatantly specious imperialist ploy in pursuit of “regime change” in that country. So, the answer to the question “why the imperialist powers want to do away with Gaddafi” has to go beyond oil, or the laughable “humanitarian concerns.” Perhaps the question can be answered best in the light of the following questions: why do these imperialist powers also want to overthrow Hugo Cavez of Venezuela, Fidel Castro (and/or his successors) of Cuba, Mahmoud Ahmadinejad of Iran, Rafael Correa Delgado of Ecuador, Kim Jong-il of North Korea, Bashar Al-assad of Syria and Evo Morales of Bolivia? Or, why did they overthrow Mohammad Mossadeq of Iran, Jacobo Arbenz of Guatemala, Kusno Sukarno of Indonesia, Salvador Allende of Chile, Sandinistas in Nicaragua, Jean-Bertrand Aristide in Haiti and Manuel Zelaya in Honduras? What does Gaddafi have in common with these nationalist/populist leaders? The question is of course rhetorical and the answer is obvious: like them Gaddafi is guilty of insubordination to the proverbial godfather of the world: US imperialism, and its allies. Like them, he has committed the cardinal sin of challenging the unbridled reign of global capital, of not following the economic “guidelines” of the captains of global finance, that is, of the International Monetary Fund, the World Bank and World Trade Organization; as well as of refusing to join US military alliances in the region. Also like other nationalist/populist leaders, he advocates social safety net (or welfare state) programs-not for giant corporations, as is the case in imperialist countries, but for the people in need. This means that the criminal agenda of Messrs Obama, Cameron, Sarkozy, and their complicit allies to overthrow or kill Mr. Gaddafi and other “insubordinate” proponents of welfare state programs abroad is essentially part of the same evil agenda of dismantling such programs at home. While the form, the context and the means of destruction maybe different, the thrust of the relentless attacks on the living standards of the Libyan, Iranian, Venezuelan or Cuban peoples are essentially the same as the equally brutal attacks on the living conditions of the poor and working people in the US, UK, France and other degenerate capitalist countries. In a subtle (but unmistakable) way they are all part of an ongoing unilateral class warfare on a global scale-whether they are carried out by military means and bombardments, or through the apparently “non-violent” processes of judicial or legislative means does not make a substantial difference as far as the nature or the thrust of the attack on people’s lives or livelihoods are concerned. In their efforts to consolidate the reign of big capital worldwide, captains of global finance use a variety of methods. The preferred method is usually non-military, that is, the neoliberal strategies of Structural Adjustment Programs (SAPs), carried out by representatives of big business disguised as elected officials, or by the multilateral institutions such as the IMF and the WTO. This is what is currently happening in the debt- and deficit-ridden economies of the United States and Europe. But if a country like Libya (or Venezuela or Iran or Cuba) does not go along with the neoliberal agenda of “structural adjustments,” of outsourcing and privatization, and of allowing their financial system to be tied to the network of global banking cartel, then the military option is embarked upon to carry out the neoliberal agenda. The powerful interests of global capitalism do not seem to feel comfortable to dismantle New Deal economics, Social Democratic reforms and welfare state programs in the core capitalist countries while people in smaller, less-developed countries such as Libya, Venezuela or Cuba enjoy strong, state-sponsored social safety net programs such as free or heavily-subsidized education and health care benefits. Indeed, guardians of the worldwide market mechanism have always been intolerant of any “undue” government intervention in the economic affairs of any country in the world. “Regimented economies,” declared President Harry Truman in a speech at Baylor University (1947), were the enemy of free enterprise, and “unless we act, and act decisively,” he claimed, those regimented economies would become “the pattern of the next century.” To fend off that danger, Truman urged that “the whole world should adopt the American system.” The system of free enterprise, he went on, “can survive in America only if it becomes a world system” . But, again, like the proverbial godfather, US/European imperialism requires total, unconditional subordination; half-hearted, grudging compliance with the global agenda of imperialism is not enough. To be considered a real “ally,” or a true “client state,” a country has to grant the US the right to “guide” its economic, geopolitical and foreign policies, that is, to essentially forgo its national sovereignty. 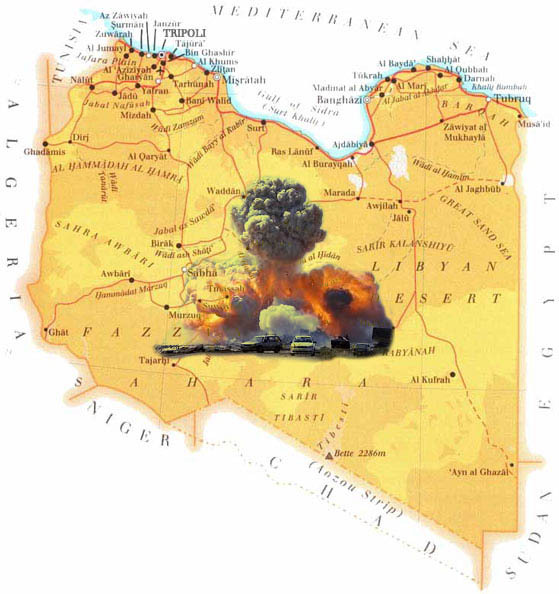 Despite some economic concessions since the early 1990s, Gaddafi failed this critical test of “full compliance” with the imperialist designs in the region. For example, he resisted joining a US/NATO-sponsored military alliance in the region. Libya (along with Syria) are the only two Mediterranean nations and the sole remaining Arab states that are not subordinated to U.S. and NATO designs for control of the Mediterranean Sea Basin and the Middle East. Nor has Libya (or Syria) participated in NATO's almost ten-year-old Operation Active Endeavor naval patrols and exercises in the Mediterranean Sea and neither is a member of NATO's Mediterranean Dialogue military partnership which includes most regional countries: Israel, Jordan, Egypt, Tunisia, Algeria, Morocco and Mauritania . Furthermore, by promoting trade, development and industrialization projects on a local, national, regional or African level, Gaddafi was viewed as an obstacle to the Western powers’ strategies of unhindered trade and development projects on a global level. For example, Gaddafi’s Libya played a leading role in “connecting the entire [African] continent by telephone, television, radio broadcasting and several other technological applications such as telemedicine and distance teaching. And thanks to the WMAX radio bridge, a low cost connection was made available across the continent, including in rural areas” . The idea of launching a pan-African system of technologically advanced network of telecommunication began in the early 1990s, “when 45 African nations established RASCOM (Regional African Satellite Communication Organization) so that Africa would have its own satellite and slash communication costs in the continent. This was a time when phone calls to and from Africa were the most expensive in the world because of the annual $500 million fee pocketed by Europe for the use of its satellites like Intelsat for phone conversations, including those within the same country. . . . An African satellite only cost a onetime payment of $400 million and the continent no longer had to pay a $500 million annual lease” . “Gaddafi put an end to [the] futile pleas to the western ‘benefactors’ with their exorbitant interest rates. The Libyan guide put $300 million on the table; the African Development Bank added $50 million more and the West African Development Bank a further $27 million - and that’s how Africa got its first communications satellite on 26 December 2007. “This is how a symbolic gesture of a mere $300 million changed the life of an entire continent. Gaddafi’s Libya cost the West, not just depriving it of $500 million per year but the billions of dollars in debt and interest that the initial loan would generate for years to come and in an exponential manner, thereby helping maintain an occult system in order to plunder the continent” . Architects of global finance, represented by the imperialist governments of the West, also viewed Gaddafi as a spoiler in the area of international or global money and banking. The forces of global capital tend to prefer a uniform, contiguous, or borderless global market to multiple sovereign markets at the local, national, regional or continental levels. Not only Gaddafi’s Libya maintained public ownership of its own central bank, and the authority to create its own national money, but it also worked assiduously to establish an African Monetary Fund, an African Central Bank, and an African Investment Bank. “had been earmarked as the Libyan contribution to three key projects which would add the finishing touches to the African Federation - the African Investment Bank in Syrte (Libya), the establishment in 2011 of the African Monetary Fund to be based in Yaounde (Cameroon) . . ., and the Abuja-based African Central Bank in Nigeria, which when it starts printing African money will ring the death knell for the CFA franc [the French currency] through which Paris has been able to maintain its hold on some African countries for the last fifty years. It is easy to understand the French wrath against Gaddafi. Western powers also viewed Gaddafi as an obstacle to their imperial strategies for yet another reason: standing in the way of their age-old policies of “divide and rule.” To counter Gaddafi’s relentless efforts to establish a United States of Africa, the European Union tried to create the Union for the Mediterranean (UPM) region. “North Africa somehow had to be cut off from the rest of Africa, using the old tired racist cliches of the 18th and 19th centuries, which claimed that Africans of Arab origin were more evolved and civilized than the rest of the continent. This failed because Gaddafi refused to buy into it. He soon understood what game was being played when only a handful of African countries were invited to join the Mediterranean grouping without informing the African Union but inviting all 27 members of the European Union.” Gaddafi also refused to buy into other imperialist-inspired/driven groupings in Africa such as ECOWAS, COMESA, UDEAC, SADC and the Great Maghreb, “which never saw the light of day thanks to Gaddafi who understood what was happening” . Gaddafi further earned the wrath of Western powers for striking extensive trade and investment deals with BRIC countries (Brazil, Russia, India and China), especially with China. According to Beijing’s Ministry of Commerce, China’s contracts in Libya (prior to imperialism’s controlled demolition of that country) numbered no less than 50 large projects, involving contracts in excess of $18 billion. Even a cursory reading of U.S. Africa Command (AFRICOM) strategic briefings shows that a major thrust of its mission is containment of China. “In effect, what we are witnessing here,” points out Patrick Henningsten, “is the dawn of a New Cold War between the US-EURO powers and China. This new cold war will feature many of the same elements of the long and protracted US-USSR face-off we saw in the second half of the 20th century. It will take place off shore, in places like Africa, South America, Central Asia and through old flashpoints like Korea and the Middle East” . It is obvious (from this brief discussion) that Gaddafi’s sin for being placed on imperialism’s death row consists largely of the challenges he posed to the free reign of Western capital in the region, of his refusal to relinquish Libya’s national sovereignty to become another unconditional “client state” of Western powers. His removal from power is therefore designed to eliminate all “barriers” to the unhindered mobility of the US/European capital in the region by installing a more pliant regime in Libya. Gaddafi’s removal from power would serve yet another objective of US/European powers: to shorten or spoil the Arab Spring by derailing their peaceful protests, containing their non-violent revolutions and sabotaging their aspirations for self-determination. Soon after being caught by surprise by the glorious uprisings in Egypt and Tunisia, the imperialist powers (including the mini Zionist imperialism in Palestine) embarked on “damage control.” In pursuit of this objective, they adopted three simultaneous strategies. The first strategy was to half-heartedly “support” the uprisings in Egypt and Tunisia (of course, once they became unstoppable) in order to control them-hence, the military rule in those countries following the departure of Mubarak from Cairo and Ben Ali from Tunis. The second strategy of containment has been support and encouragement for the brutal crackdown of other spontaneous and peaceful uprisings in countries ruled by “client regimes,” for example, in Bahrain and Saudi Arabia. And the third policy of sabotaging the Arab Spring has been to promote civil war and orchestrate chaos in countries such as Libya, Syria and Iran. In its early stages of development, capitalism promoted nation-state and/or national sovereignty in order to free itself from the constraints of the church and feudalism. Now that the imperatives of the highly advanced but degenerate global finance capital require unhindered mobility in a uniform or borderless world, national sovereignty is considered problematic-especially in places like Libya, Iran, Syria, Venezuela, Bolivia and other countries that are not ruled by imperialism’s “client states.” Why? Because unhindered global mobility of capital requires doing away with social safety net or welfare state programs; it means doing away with public domain properties or public sector enterprises and bringing them under the private ownership of the footloose-and-fancy-free global capital. This explains why the corporate media, political pundits and other mouthpieces of imperialism are increasing talking about Western powers’ “responsibility to protect,” by which they mean that these powers have a responsibility to protect the Libyan (or Iranian or Venezuelan or Syrian or Cuban or ...) citizens from their “dictatorial” rulers by instigating regime change and promoting “democracy” there. It further means that, in pursuit of this objective, the imperialist powers should not be bound by “constraints” of national sovereignty because, they argue, “universal democratic rights take primacy over national sovereignty considerations.” In a notoriously selective fashion, this utilitarian use of the “responsibility to protect” does not apply to nations or peoples ruled by imperialism’s client states such as Saudi Arabia or Bahrain. . There is no question that global capitalism has thus woven together the fates and fortunes of the overwhelming majority of the world population in an increasingly intensifying struggle for subsistence and survival. No one can tell when this majority of world population (the middle, lower-middle, poor and working classes) would come to the realization that their seemingly separate struggles for economic survival are essentially part and parcel of the same struggle against the same class enemies, the guardians of world capitalism. One thing is clear, however: only when they come to such a liberating realization, join forces together in a cross-border, global uprising against the forces of world capitalism, and seek to manage their economies independent of profitability imperatives of capitalist production-only then can they break free from the shackles of capitalism and control their future in a coordinated, people-centered mode of production, distribution and consumption.